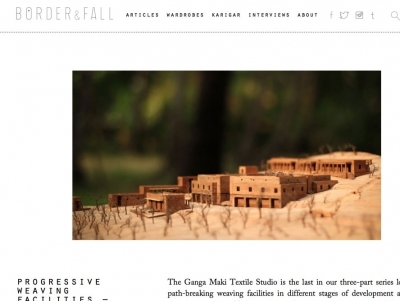 Ganga new workshop project is featured in a net magazine, Border & Fall, which specializes India’s craft and fashion. The title of the article is 'progressive weaving facilities - part III’, one of the three stories which present 'path-breaking weaving facilities in different stages of development across the country’. The article consists of interviews with Chiaki Maki and the architect Bijoy Jain. You will see how Ganga Maki studio is like, how the construction work has developed, how Bijoy has been involved in it etc..
Just open the link and read. The photos by Studio Mumbai worth seeing.